Meredith tells us about how patients look at doctors like gods. The problem comes when the doctors start seeing themselves like that. The pregnant woman needs emergency surgery, but her husband tells Derek and Addison that if they're forced to choose, save his wife. During the surgery, things go wrong for the mother, but Derek still feels incredible guilt for his mistake, so he does everything he can, including cutting out large chunks of her brain. Addison thinks the woman is dead and wants to remove the baby. She threatens to perform a C-section while Derek prepares to cut out the mom's frontal lobe. The husband gets furious and calls Derek a murderer. A man who had his spleen removed at Seattle Grace has an infection because the surgery was done poorly and in an old-fashioned way. Cristina whines that it’s because he was operated on by Dr. Campbell, an old woman who Yang thinks should just retire. Naturally, Campbell overhears. Campbell tells off Yang and Hunt reluctantly backs his superior. The balance of power shifts, though, as Cristina discovers a major mistake during a CT.
She runs to the Chief to rat Campbell out. The Chief explains the situation to the patient, but he still wants Campbell to perform his next surgery. The Chief thinks that’s the end of that, but Cristina won’t let it go. In surgery, Campbell goes all passive aggressive on Cristina. After being lectured about needing to know the ins and outs of procedures without all the modern technology, Cristina loses it and says that modern techniques would have prevented the careless mistake Campbell made. 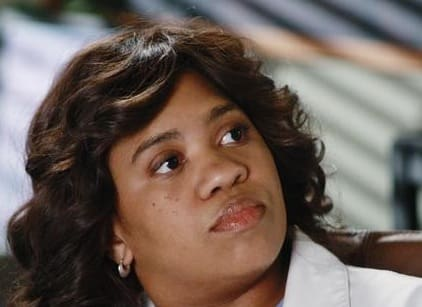 Campbell throws Cristina out of the OR. After the surgery, Owen tries to give Campbell a nudge towards retiring. Cristina returns to pseudo-apologize, and Campbell says she’s retiring because she used to be a surgery god, but now she isn’t. Izzie is confronted by a patient who complains that Izzie told her she had cancer when she’s since learned that she is merely anemic. Izzie must have switched the results ... with someone else. Herself. Izzie heads to the bathroom to check for lumps to try and find the cancer. She eventually visits a dermatologist for a mark she found on her back. Combined with her recent inability to see things and her hallucinations, the signs are all adding up against her. She tries to teach the interns by using herself as a case for them to properly diagnose. Bailey is preoccupied with getting letters of recommendation from the Chief and George so she can finally start a new career as a pediatric surgeon. George’s letter is nothing short of glowing, so Bailey confronts the Chief to wonder why his letter wasn’t as good. Richard's response is that he has a neurosurgeon accused of murder, an aging surgeon he needs to fire, and interns screwing up left and right. He also feels like Bailey is abandoning his dream of having taking over as Chief one day. All of that combined got her a nice form letter. Callie asks Arizona on a date, but after learning Callie has only been with one other woman (Hahn) Arizona loses interest. At the bar that night, Callie confronts Arizona and says she’s experienced in life, but after her big speech, Arizona introduces her date and Callie rushes away, embarrassed. Lexie is tired of Mark Sloan hiding in the attic, and she wants him to tell Derek about their relationship so she can feel free. He finally does tell Derek. But after the day Derek has had, this does not exactly end well. Derek punches him, and hard. Then Derek punches him again. Then Sloan retaliates and it turns into a huge melee with PLENTY of punches and blood. And the whole hospital watching. Owen finally rushes in to stop it. That night, the fighting men are nursed back to health by their respective Greys.